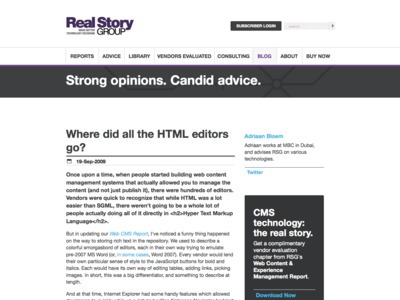 Tim Strehle’s Blog » Where did all the HTML editors go? "By now, all but a few CMS products have thrown in the towel. You can have whatever UI you want, but the editor is likely going to be either TinyMCE or FCKeditor. […] The real consolidation isn't in products or projects; it's in components. Know about Lucene and Solr; and Tiny or FCK -- and spend your time on the real differences."